You know you missed Camlann’s rant. Speaking. Camlann’s Rant after the cut. XD Since someone will inevitably ask for it. And that’s only the start of it. I spent a lot of time contemplating just what I’d do to you once I got my hands around your thin little neck and got to strangle it. Oh, you may have your super powers but I’m supreme! Super strength means nothing when I can boil the seas and bring fire to the north winds and everything else. Or maybe I should just summon a beast from the depths of hades to burn you alive or hunt you down like a dog. And don’t even get me started on what I have planned for your little pink haired friend. I still think he’s just as guilty by the way. I’m shocked as much as he bosses you around that he didn’t ask you to do things for him through me. It’s just unthinkable even now after all this time as passed. But really. What about me wasn’t good enough? If it was the talking thing, you only had yourself to blame for that! I would have kept it to normal, civil conversations if you’d just kept your end of the bargin! And perhaps now it’s worse because I’ve just spent a few weeks alone in space by myself. It’s possible. I won’t deny it. So, what say you Wiglaf!? Are you ready for round two? I am. I’m rather excited for tour latest bout. And is that a dragon? Even better! We have a spectator for our sport! Perhaps I shall use him, too. I could conjure up a dragon rider and replace that twit sitting on its shoulder. Honestly, an ice dragon. Who would bring one of those down there? It’s like they have no reason to call upon a nicer one like a good old fashioned rock dragon.A rock dragon would really bring the house down you know. Or maybe a water dragon! Oh, I like those. No wait, I was yelling at you for abandoning me! What sort of swordsman are you? Aren’t heros supposed to take care of their weapons! I’m a good sword! I am you know! I can do just about anything! And right now I’m going to take you out until you learn to appreciate me! Yeah! That’ll show you what you were missing out! And by the way, may I say that it is AMAZING being able to use my own magic? I really must thank that one sword fellow for turning me human and allowing me to use my gifts. Being forced to use a catalyst to activate them before was so boring. Especially when they were like you and left me in that stupid sheath! But I’m not bitter, oh no, Bitter doesn’t even begin to describe my absolute hatred of what you did to me. This is vengeance! Plain and simple vengeance! And well, it’s a little fun, too. I mean, I get to attack for myself for a change! How wonderful is that? I think it is. Don’t you agree? I think you should agree with me Wiglaf! Not that you could possibly make my grudge any worse than it is. Or maybe you could manage to pull that off. You are PERFECT after all! Perfect at this, perfect at that, perfect at languages and art, and fighting! But did you use your perfect brain to consider my feelings!? No. Though, I might forgive you if you bow down and grovel. Yes, I think I could do that. Grovel and beg my forgiveness and I might let you be my owner again. You hear that? Not only am I all powerful, I’m also generous too! See? I’m generous. So take advantage while I still let you. If you don’t, I’ll have to blow you to bits and that just won’t be very gentlemanly like now will it? Are you even listening to me at all down there? I’m starting to think that you’re not. And what do you mean some other time!? How could we do this another time!? The time is now and you need to decide and if you keep looking at me with that grin I’m just going to lose it and light you on fire. Or freeze you. That might be more fun considering there IS an ice dragon over there. But then what will I do afterwards? Oh yes, I know. I’ll go after Mordred and cook him alive. And then maybe I’ll just cause some chaos! Yes, chaos is good. Or maybe Mordred will see the light after I’ve IMPALED you for show. HA! How would you like that? It’ll be your turn on a mantle! Yes, we can stick you in a sheath and leave you to rot with no one to talk to for eons. No wait. I’m getting off topic. I’m here. I’m going to mess you up. You have a chance in there to beg for my forgiveness. Why? Because no one can say I’m not fair! Yes, fair and wise. Camlann the fair and wise. I like the sound of that, don’t you? Generous, fair, handsome, powerful…am I missing any adjectives? Surely you have one or two Mr. perfect. And what is with those two over there? Dont’ they have anything better to do? Can’t they see they’re interupting our moment? This is between you and me! And maybe Mordred. And that Driver person. He was just as guilty too! You were all against me! Oh, just thinking about it all over again makes my blood boil…oh yes! I have blod now! How cool is that? If you manage to cut me, hard as that would be, I’d actually bleed! I have flesh and no wait! I’m supposed to be destroying you! II can you know. Destroy you that is. It’d be like squashing a bug! A bug! Also, shouldn’t it be ‘shoe-in’? Dear lord that rant could be its own chapter in a book. Yes, Sedrick’s happy place is truly frightening to contemplate. I hope someone draws a picture! Oh, I just left your comic! Off topic much with that Monolog? Boy he gets distracted easily, one would think that time to his self would teach him how to focus, and not get sidetr… Oohh, Shiny! BTW when is th next Pair-A-Thon, going to start? 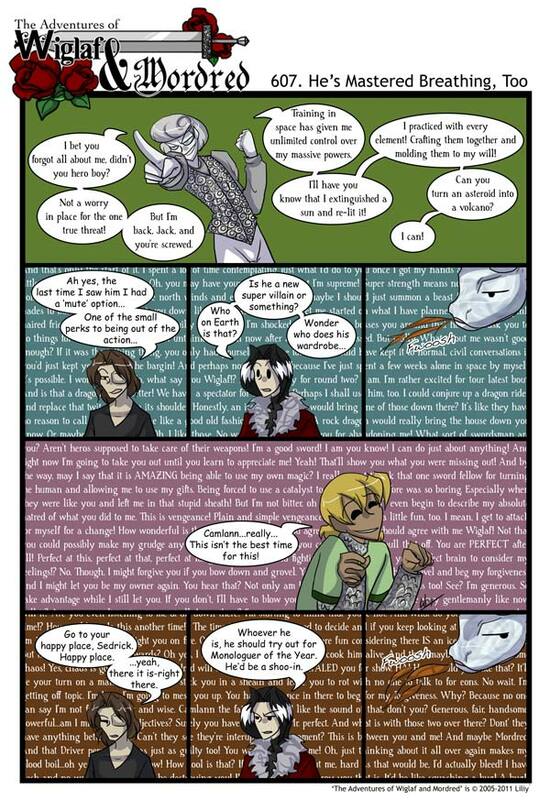 I now have an odd urge to pair Camlann with the Dragon, at you mentioning the pair-a-thon… Thank you for that. K thanks. I’m going to enter this time around. Anyone else curious about what Sedrick’s happy place is? Do you remember that pin up of Young Mr. G? It probably looks something like that, only replacing Mr. G with Sedrick, of course. Where do you get the time to right Camlann’s lines?! They’re crazy long! Miss his ranting? no, no you must have mistaken. I missed his presence. he ability to monologue a castle gate(complete with a one way entrance) is something I agree with sedrick. Heh heh, it’s great to hear another classic Camlann rant. I eagerly clicked the link so I could read the whole thing. XD Camlann’s still mighty sore at Wiglaf and Mordred, but he’s sure happy to be back. Nice job as always, Liliy! HA! Camlan still seems to think Driver is a guy. I wanna know what the dragon thinks of the conversation; he looks pretty annoyed. Kind of like Mordred does a lot of the time. I just finished a physics final dealing with relativity and whatnot so I couldn’t help but calculate how fast Camlann would have to be going to go to a sun and put it out. Assuming a few weeks = 3 weeks so 10 days to get there and 10 days to get back. If he went to the sun he’d be going 381625 mph. If he went to the next nearest star (Proxima Centauri) he’d be going 1.039×10^11 mph, or about 155 times faster than the speed of light. Totally unrelated to that I just noticed that if you scroll all the way down to the bottom of the page and look at the lower left hand corner there is a tiny little smiley face. It just made my day. I tried to explain what was happening in the comic to my six year old brother, and it was just so confusing. And fun, lots of fun. I’m really glad that it’s mostly child friendly too. He did refuse to have me read Camlann’s rant to him though. Is sedrick looking at Arthur when he finds his happy place? Camlann needs to get together with Excalibur from Soul Eater. I believe the two swords would go quite well with each other. I used to try and read every single word Camlann was saying. Tried to care. I just can’t. Now I’m just skimming what he says, hoping for a mute button also.